beating to make weddings more enchanting is still alive in twin cities of Islamabad and Rawalpindi as they are seen frequntly in their traditional yellow attire on various places. 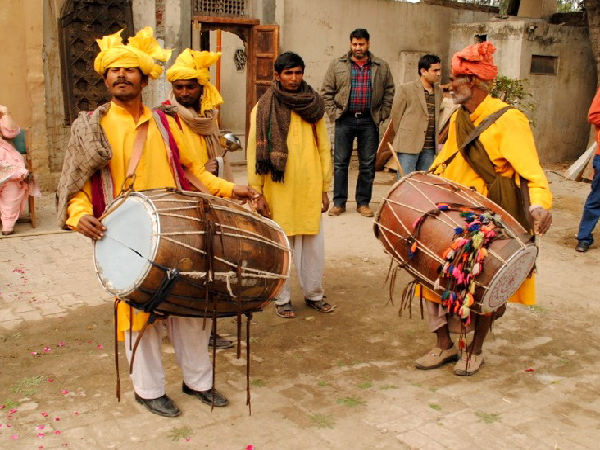 The traditional drum-beaters waiting for customers are seen at Shamsabad, Chadni chowk besides other places in both the cities. People belonging to every class, on eof them told APP, prefer to hire (Dhol Wala) in ‘Mehndi’function to make fun and add feativity. Riaz Ahmed a drum-beater said “Wearing special dress was our family business adding “We do not like to change our profession despite number of problems”. Another drum-beater said,” People paid thousands to the bands drummers despite the advance equipment to give traditional touch to their wedding ceremonies”. Immad Hassan said that this was a centuries-old custom adding but today, it was no more an attractive way of entertainment. Drum-beaters demanded that the authorities concerned should take initiative for keeping the old tradition alive by organizing courses of traditional drum beating.